The Martyr Tryphon was born in one of the districts of Asia Minor – Phrygia, not far from the city of Apameia in the village of Kampsada. From his early years the Lord granted him the power to cast out devils and to heal various maladies. The inhabitants of his native city were once saved by him from starvation: Saint Tryphon by the power of his prayer forced back a plague of locusts that were devouring the bread grain and devastating the fields. Saint Tryphon gained particular fame by casting out a devil from the daughter of the Roman emperor Gordian (238-244). Helping everyone in distress, he asked but one fee – faith in Jesus Christ, by Whose grace he healed them. Later on the relics of Saint Tryphon were transferred to Constantinople, and then to Rome. The holy martyr is accorded great veneration in the Russian Orthodox Church. There exists a legend, that during the reign of tsar Ivan the Terrible at the time of an imperial hunt, a gerfalcon beloved by the tsar flew off. The tsar ordered the falconer Tryphon Patrikeev to find the flown off bird. The falconer Tryphon journeyed about through the surrounding forest, but without luck. On the third day, exhausted by long searching, he returned to Moscow to the place now called Mar'ina Grove, and in weariness he lay down to rest, fervently praying to his patron saint – the Martyr Tryphon, beseeching him for help. In a dream he saw a youth on a white horse, holding on his hand the imperial gerfalcon, and this youth said: "Take back the lost bird, go with God to the tsar and be not aggrieved about it". Having awakened, the falconer actually spotted the gerfalcon not far off on a pine tree. He then took it to the tsar and told about the miraculous help, received by him from the holy Martyr Tryphon. 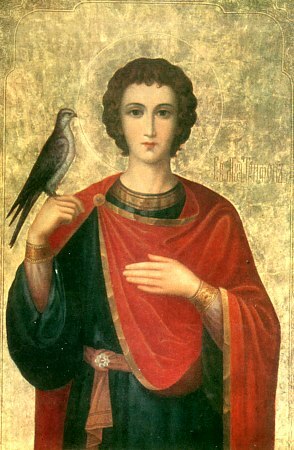 After a certain while the falconer Tryphon Patrikeev built a chapel on the spot where the saint appeared, and later on also there was a church in the name of the holy Martyr Tryphon.